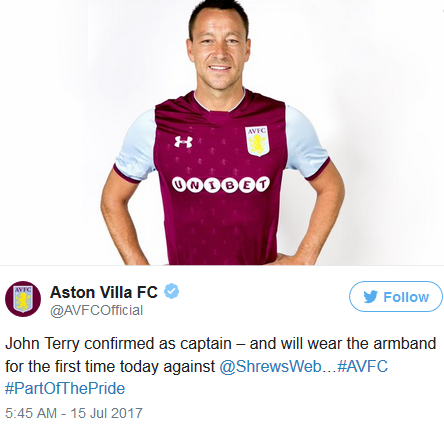 John Terry named Aston Villa captain for 2017/18 season – Royal Times of Nigeria. John Terry has been named the captain of Aston Villa after joining the club from Chelsea. The 36-year-old took the armband from James Chester, and wore it just hours later yesterday in the pre-season friendly at Greenhous Meadow where his new club was defeated by League One Shrewsbury who beat Aston Villa 2-1.